The Panasonic GH4’s versatile lens mount opens up a whole new world of lens options to you. However, these new options also come with a completely different set of rules compared to buying native lenses. Welcome to the world of legacy lenses. One of the best things about having such an adaptable lens mount on the GH4 is that you can use legacy lenses– older lenses that have fallen into disuse simply due to being bound to a discontinued lens mount or because they lack modern amenities such as autofocus. With the aid of a simple adapter, you have access to all of this awesome glass that would otherwise sit unused in someone’s closet. Modern lenses are great, but it’s getting harder to find lenses that have features important to filmmakers, such as a smooth focus ring with hard stops. Fly-by-wire focusing rings on modern lenses are not made for repeatable manual focus when shooting video, but many legacy lenses have buttery smooth focus rings with a nice long throw and real hard stops. Autofocus is convenient when shooting stills, but it’s far less useful for video production. Simply put, you cannot depend on autofocus to consistently lock on the subject when shooting video. Instead, manual focus is essential for keeping your subject in focus. Manual focus isn’t easy, especially at wide apertures, but legacy lenses with smooth manual focus have been given a new life thanks to the GH4’s focus peaking. With focus peaking enabled, it’s child’s play to quickly and accurately keep the subject in focus when shooting video. As a result of the exodus to modern lenses, legacy lenses are now available at rock bottom prices. Considering that the quality of legacy lenses are on par with– if not better than– modern lenses, buying legacy lenses is the best way to build a high quality set of glass without breaking the bank. There’s no doubt that legacy lenses represent an incredible opportunity to get your hands on some great glass. 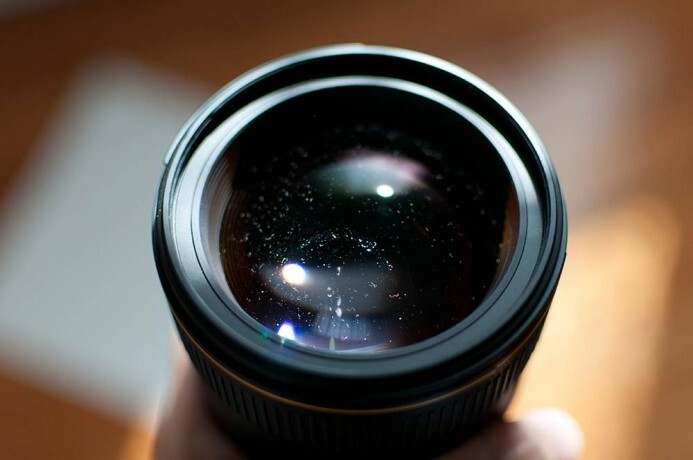 However, when you’re buying lenses that could be over 50 years old, there are some things you need to consider that don’t come into play when buying modern lenses. It should go without saying, but scratches on the lens aren’t ideal. That said, when you’re buying legacy lenses that have been in use for several decades, you might encounter a lens with the odd scratch. The good news is that scratches don’t affect image quality as much as you would think, so a small scratch or cleaning mark should not pose a problem. Larger or deeper scratches can affect sharpness and lens flare, so they should be avoided. 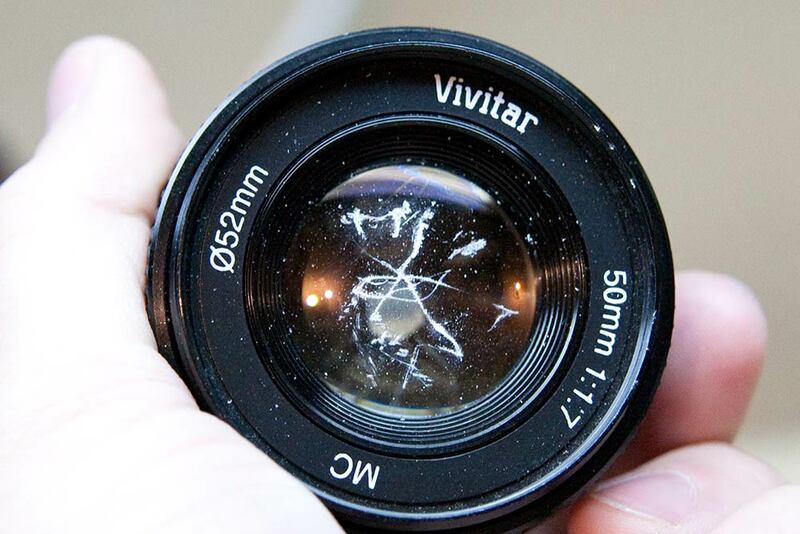 Bottom line: Avoid lenses with scratches when possible, but a minor scratch or cleaning mark isn’t the end of the world. 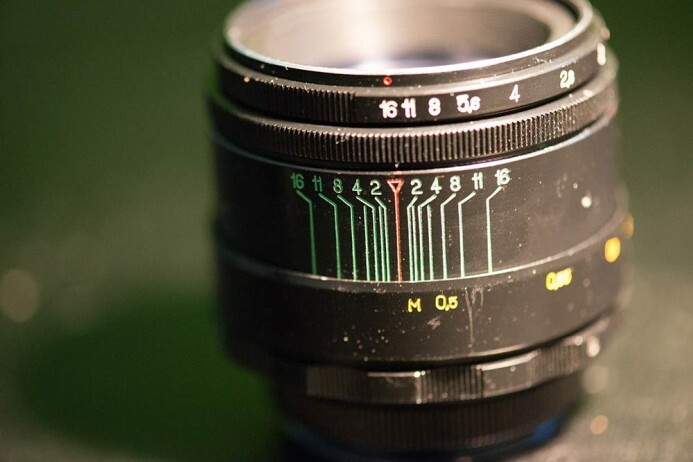 Lenses might be assembled in a dust-free clean room, but as soon as they are released into the wild, dust will eventually find its way into a lens. Legacy lenses that have been around the block a few times, so there’s sure to be some dust in the lens. Thankfully, like scratches, unless it’s very heavy, dust will not noticeably affect image quality. The lens might not look as pristine as a brand new lens, but at least the dust won’t show up in your footage and stills. Bottom line: Dust is everywhere. Deal with it. Small amounts of dust particles in the lens do not affect image quality. After years of use, there’s bound to be some wear on the lens barrel. There may even be some damage. However, unless the damage affects the operation of the lens, it should not be a cause for concern. Like dust in the lens, barrel wear may not look pretty, but it won’t affect image quality, which is what really matters. 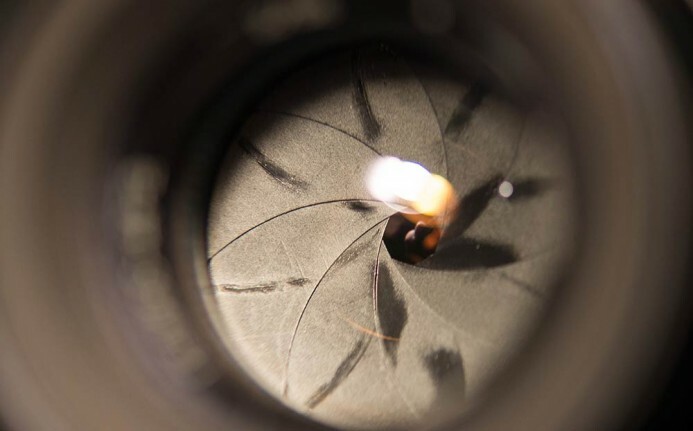 How can damage affect a lens’ operation? If the lens still works, everything should be fine, right? Not quite. 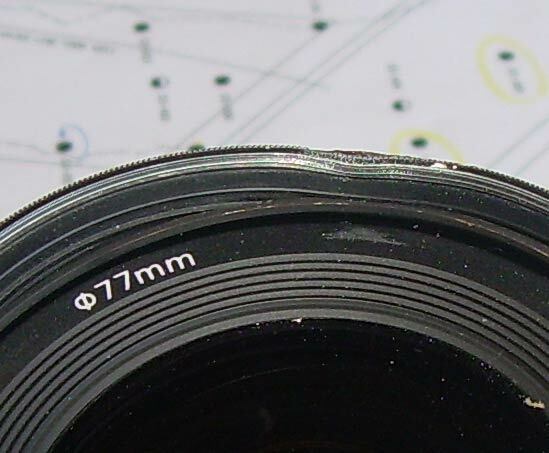 I once received a lens with a small dent on the focus ring. The focus ring still functioned, but it occasionally made a quiet scraping sound as it turned. This sound is not a problem if you’re only shooting stills, but could definitely be an issue when shooting video if the mic picks it up. Bottom line: Lens wear is fine. Damage that affects the operation of the lens in any way should be avoided. The first thing most people look for when inspecting a legacy lens is scratches on the front of the lens. What many of them miss though are the filter threads. Damaged filter threads often go unnoticed at first because they don’t directly affect the image. However, once you need to mount a filter, a damaged thread can become a serious hindrance. If you cannot mount a filter due to damaged threads on the lens, you either have to shoot without filters or resort to using a matte box, substantially increasing the bulk of your camera setup. Neither option is ideal. An even worse scenario is when you can mount the filter on a lens with damaged threads. Later, when you try to remove the filter, you may find that it simply won’t budge. Damaged filter threads can cause a filter to get stuck on the lens. Your only recourse then is to disassemble the filter (which usually involves breaking the glass) and prying off the filter. Doing this without damaging the lens itself is tricky business indeed. Bottom line: Damaged filter threads are a deal-breaker. Always confirm that a lens’ filter threads are fully functional. Fungus is everywhere! Under the right conditions (usually involving moisture or acute temperature changes), fungus can even grow in a lens. In the short term, the haze caused by fungus can decrease the brightness and sharpness of a lens. Over time, fungus can corrode the lens’ coatings, making the lens more prone to flare and reflections. If left unchecked, fungus can eventually etch into the glass. Fungus usually grows inside the lens before spreading to the glass so it’s impossible to confirm that a lens has no fungus at all. If fungus does appear down the road, take it immediately to a local camera shop to have the fungus removed. 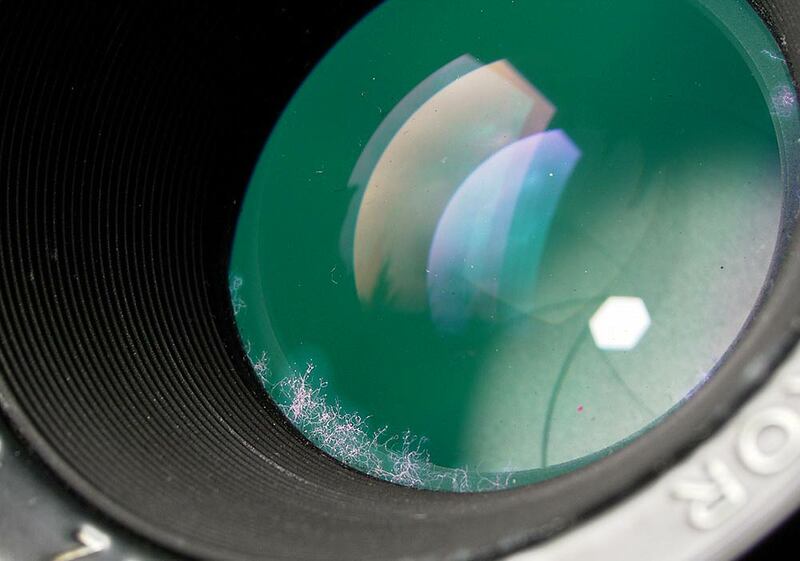 Bottom line: Avoid any lens with fungus on the glass. As a lens ages, lubricant from other internal components can leak out onto the aperture blades. Generally, oily aperture blades do not directly affect image quality. However, oil can cause the blades to respond sluggishly when you attempt to adjust the aperture. This affects the amount of control you have over the lens and can be a problem when shooting either video or stills. Bottom line: Stay away from lenses with oil on the aperture blades. Are you excited about the potential of the Panasonic GH4 and its versatile Micro Four Thirds lens mount, but feel overwhelmed by all the options? The Panasonic GH4’s MFT system may be completely new territory for a many of you. It’s such a versatile system that it can all be a bit hard to digest. I’ve been shooting on the MFT system and Panasonic’s GH-series cameras for several years and I want to help you find your bearings quickly so you can get back to shooting awesome stuff! That’s why I’m currently offering free consults to help answer your questions. If you are a filmmaker, you owe it to yourself to explore legacy lenses. Legacy lenses give you access to unique and amazing glass at affordable prices. Now that you know what to watch out for when buying legacy lenses, you can ensure that you get great lenses every time. Grab some legacy lenses and get shooting! Lenses for the Panasonic GH4 — Awesome glass for an awesome camera. Memory Cards for the Panasonic GH4 — Get the right memory cards for HD and 4K. Configuring the Panasonic GH4 for Video Production — Set the GH4 up for filmmaking. Rigging the Panasonic GH4 — Cages, Rigs, Components, Gear, and Reviews. Stabilizing the Panasonic GH4 — Tripods, Monopods, Sliders, 3-Axis Gimbals, etc. Maximizing the Panasonic GH4’s Audio Performance — Sound matters. Powering the Panasonic GH4 — Keep the GH4 shooting all day. Should you buy the YAGH for the Panasonic GH4?